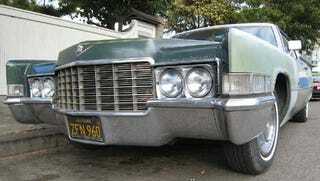 We've been a little light on Cadillacs in this series, having seen only a '37, a '60, and a '78 so far. This wouldn't be a big deal, except for the fact that we've missed out on the Caddies from the era of maximum horsepower out of those great big 472- and 500-cube engines. So here's a 472-packin' 1969 Calais for this fine Friday morning. This particular Cad registers a pretty high reading on the Beater-O-Meter; note the inevitable GM rear-window rust and fuzztastic 6x9 speaker. Still, it has style like crazy. The Calais was the lowest-priced Cadillac for 1969; you got the 375-horse 472 engine and all the standard luxury goodies the Cadillac owner expected, but at a price a few hundred bucks lower than the DeVille. Of course, it still wasn't cheap; according to the Inflation Calculator, this car's $5,484 purchase price equates to $30,702 today. Even as late as 1969, Cadillacs still had fins. Cadillac started the fin craze and they were going to finish it, too! I think what this car needs is a slew of engine parts from Maximum Torque Specialties, a radical weight-loss program (you don't need stuff like a heater or windows that go up and down, and fiberglass buckets are plenty comfortable! ), and the biggest tires that can possibly fit in the rear wheelwells. Or, hell, leave it just as it sits.